Teams of volunteer snow wardens could be set up across Lancashire in order to keep the county’s more minor routes passable during the worst of the winter weather - and they might be helped by young offenders. The proposal, which is unlikely to take effect until winter 2019/20, could see youth offenders spreading grit on the roads and clearing snow as part of their community payback. The idea was one of a series of recommendations made by a task group of county councillors exploring how Lancashire’s secondary routes can be kept safe when hit by severe weather events like last year’s so-called “Beast from the East”. Cabinet member for highways, Keith Iddon, said that he “embraced” the suggestion that youth offenders should take part in the scheme, subject to receiving the necessary legal clearance. “They will be mixing with other people and it may change somebody’s life in the future. 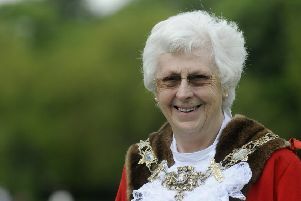 They can work with [councillors] and may benefit from their wisdom and influence - [it might] change their attitude towards society,” County Cllr Iddon told a meeting of the authority’s internal scrutiny committee. County Cllr Keith Iddon says using youth offenders to help snowbound communities could "turn somebody's life around"
The wider volunteer scheme would involve co-ordinated teams being provided with the necessary kit and training by the county council. However, members heard that “a significant amount of work” was still required in order to determine exactly how it would operate and that it would first be trialled in the east of the county. Meanwhile, there was cross-party of condemnation of developers slow to bring the roads on their new estates up to a suitable standard to be taken on by the local authority. The delay has led to a growing number of unadopted roads which are not eligible for council-supplied grit bins as a result. Committee member John Fillis said national rules needed to be tightened so that housebuilders were forced to hand over the roads they had constructed within a set timeframe. “These developers will get away with whatever they can and they hope at some point that the public purse will take over their responsibility - they walk away again and again,” County Cllr Fillis said. County Cllr Iddon accepted that the authority was “at the mercy” of developers under the current system, but told councillors that County Hall did not have the power to ask district councils to make the installation of grit bins a planning condition on new estates. The county council has also agreed to consider requests from councillors for new grit bins to be added the county’s roads network, but declined to carry out a review every two years because of the cost in staff time. The committee heard that, in spite of a reduction in the number of contractors bidding for contracts to help clear secondary routes when necessary, there was “county-wide coverage if required”. 2,054 grit bins across Lancashire - 450 in Preston, Chorley, South Ribble and West Lancashire and the majority of the remainder in the east of the county.